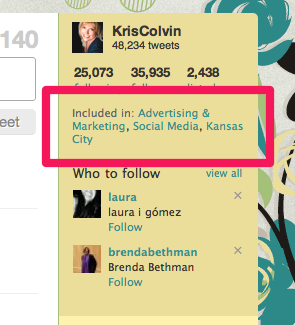 I’m a bit befuddled but wanted to share some mysterious features that just showed up on my Twitter.com screen. The second feature is a straight-up knockoff of one of Mr. Tweet’s most helpful features. If you see the picture below, it shows me who of my friends is ALSO following this user, so that I might make the decision more easily about following him myself. I see now why Mr. Tweet shut down and will be releasing another product soon. What do you think of these new features? I’m wondering what else they’ve got cooked up that we don’t know about! Heh! I am the person who wrote the ‘remove the who to follow’ tweak that’s I’ve already written the filters to block the 2nd of these. As soon as the others show up, they are going down, too. Oh, what do I think? Obnoxious. So far, I really like these features. Anything that takes the work out of determining the follow is of use to me–and saves time on paring down the Twitter list later. I’ve found these really useful so far. I am setting up my website and interested in incorporating social media in my medical practice. This piece had several ideas that could easily translate for that purpose. Do you know of any good sites/examples etc. you could point me towards? We have a number of posts about the medical industry you might want to check out. I don’t specifically know of any really great sites right now, but we have actually submitted two proposals that pretty much represented the ultimate medical site and I will write another post about that specifically and draw from those. We did a live event for Meers Advertising not long ago, who hosted a panel on social media in the healthcare industry. If you want to watch that, the recording is at: http://www.twitterface.com/meersadv and all the posts that followed that event are here: http://freshid.com/category/health-care I think you’ll find a lot of good information in those. TLists has been curating their lists for several months now. They seem to be static in nature. I keep going on/off lists. Personally I am enjoying these new features and think they will add to the experience for new users. I do think they need to do some tweaking – like hovercards on the Who To Follow recommendations – and, of course, the ability to disable all of these options. Sharon, I agree strongly about needing the ability to turn on or off these new features from your line of vision. One thing Twitter has ALWAYS been, is the anti-Facebook. The GUI lacked some features, but it was clean and neat and easy to look at, plus with the ability to customize colors and backgrounds you can make it exactly what you want to look at all day. They are reminding me more and more and more of Facebook, and they need to CUT IT OUT. There’s no reason why ANYONE should be forced to see these features, when a simple toggle on/off mechanism could be added to our settings area to let us choose.